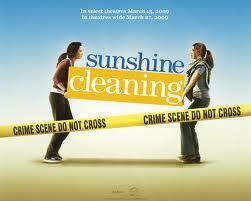 I’ve just saw a movie under the name of “Sunshine Cleaning”. It’s a 2008 movie, but it was under the New Releases section in the Blockbuster video store where I live. Happens all the time. Amy Adams is so desperate to get away from the “Enchanted” movie so in this one she takes her clothes off, looking amazing by the way. And acts the part of a very responsible woman who was the head cheerleader back in high school but that never did pay off as she would expected. Reminds me of “Married with Children” is an American situation comedy where the cheerleader, home coming queen marries the quaterback of the football team and the result is disastrous. In this movie, Amy Adams is “Rose”, she was the head cheerleader in high school and still is beautiful, but cleans houses for a living. She is the lover of the father of her child, that used as well to be the queaterback back in high school and now is a married cop with one daughter and other in the way. How can she be such a looser? because her mom killed herself. Her mom was beautiful but she married the character played by Alan Arkin in a part I think I’ve seen him play before in “Little miss Sunshine”. Kind of eccentric, much of a depressed spirit. Emily Watson is the off railed daughter, Amy Adams’s sister. She tries oh so hard to not use her british accent but not always succeed. Is a movie about what happens when all you want is money and you don’t have it. And you want it for the good reasons, but still, can’t have it. Clinton Collins, who called my attention in “Capote” a lot, now makes another excellent role with the man in love with “Rose”, the only mature person in the whole movie.